Release way back in 1987, the original Contra was notorious for a number of reasons, not least because its two main characters are quite clearly Arnie and Sly and because it's one of the most unforgiving side-scrolling shooters ever coded. So what happens when said toughie makes its revamped debut on smartphones? You get Contra Mobile, is what. 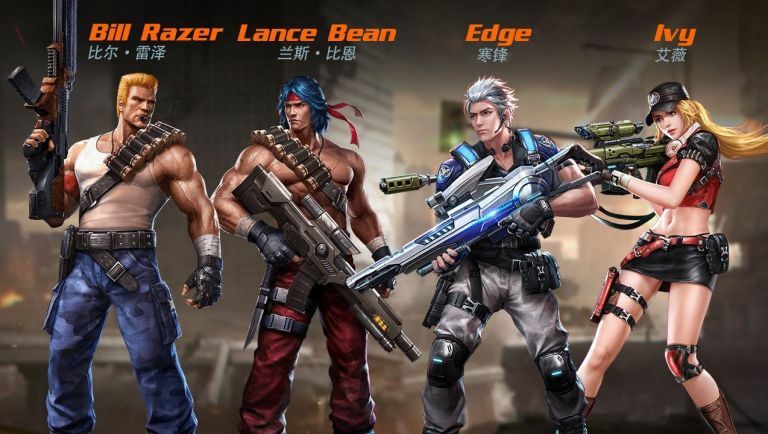 Japanese publisher Konami has teemed up with Chinese investment firm Tencent, which has plenty of experience in the lucrative mobile gaming market in Asia, to bring the original Contra experience to a whole new audience. The new version will be a HD remix of the game you remember, the only difference being this time will be a new touchscreen control system a player-versus-player mode. This being 2016 and all, Konami has confirmed that Contra Mobile will feature microtransactions but the publisher is yet to confirm exactly what these payments will relate to. This isn't the first time the partnership of Konami and Tencent has brought Contra to the mobile platform - 2013 saw the release of Contra: Evolution, an Asia-only title that received pretty damning reviews for its clunky control system. At the moment, Contra Mobile is only slated for a China and Japan release at the moment, but should it prove popular there's no reason the classic run and gunner shouldn't make its way onto Western iOS and Android devices in the near future.